And then there are those moments when it’s perfect, and easy, and fun, and you find yourself falling back in love with the cooking, the writing, the shooting all over again, as if nothing more had transpired than a fickle lovers quarrel in the middle of the night. This beet salad is spectacular. It quietly arrived and has been slow to be forgotten. Thinly shaved beets are bolstered by toasted walnuts and fresh chèvre, and finished with just a hint of champagne vinaigrette as if determined to leave you wishing for more. Because sometimes, it really is just that easy. Red, golden, purple beets…so many to choose from. Preheat oven to 400 degrees and adjust rack to middle position. Wash beets and trim ends. Tightly wrap in tin foil, put in a pan to catch any juices, and roast until firm tender when checked with a knife, about 1 hour pending their size. Set aside. Meanwhile, assemble the champagne vinaigrette via thoroughly combining the champagne vinegar, lemon juice, olive oil, and salt and pepper to taste. Once beets are cool enough to handle, rub skins off using paper towels for easy clean up. 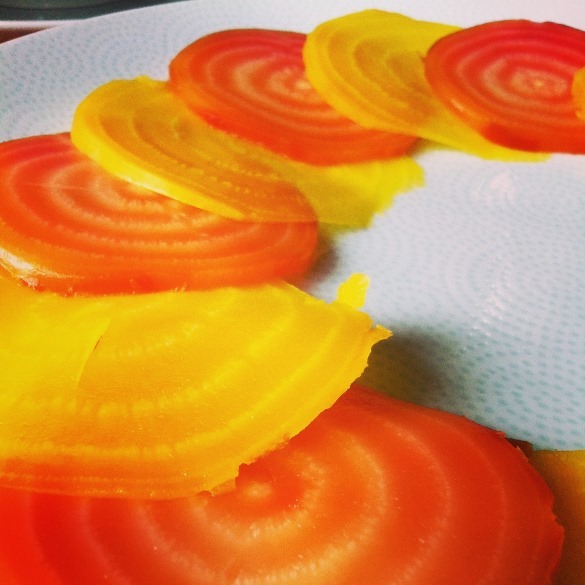 Using a mandolin, slice the beets as thinly as you’re able. To assemble, layer the beets in alternating color, top with walnuts and goat cheese, and finish with a drizzle of vinaigrette. Gorgeous Erina! 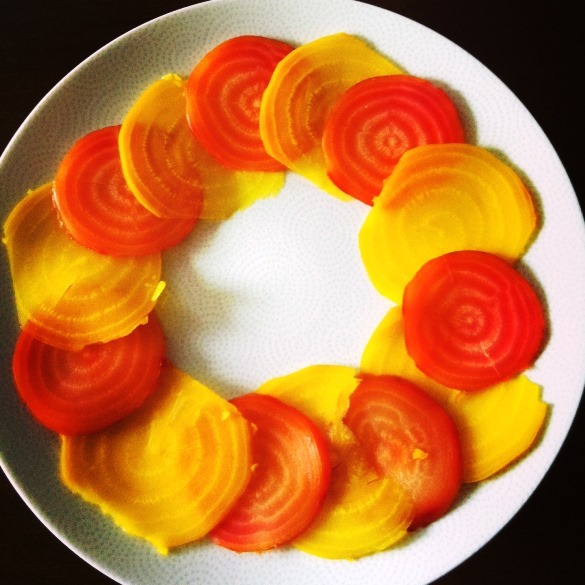 I have a love/hate with beets but this is one way I am sure I would love them and it’s so simple! You would love these Alyssa! I’ve never understood why beets have such a bad reputation…they can be so good! Roast beets are so terrific! I love them in a salad, and yours is particularly nice. Great combo of flavors – thanks so much. Thanks John! I’ve tried lots of different styles of cooking them and I definitely think roasting is the way to go. I will trust you that this is good because I don’t care for beets. I do like their colors though! 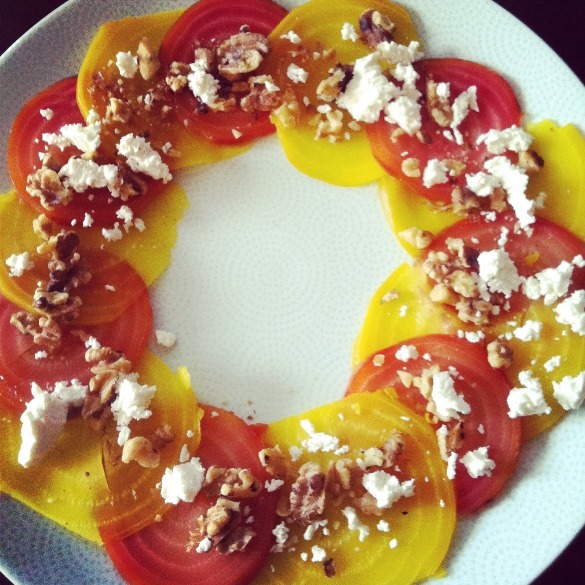 Erina, roast beet and goat cheese salads are my favorite. Such great colors. I know many (like my husband) hate beets. Think they taste like dirt. I love them. Add some greens, roast chicken, great meal! Nice post! I love beets in any form, but agree that roasted are truly best. And combined with goat cheese and walnuts? Yes, please. Such a pretty salad, too! Have a wonderful weekend!